Riley “Mac” Cormac is too big, far too gorgeous and much, much too enticing. And for the next three months, he’ll be sharing a lake house with Leia. Riley is also best friends with her little brother—and the same age. Will Leia be able to avoid the temptation of Riley, or will his persistence pay off? Stephanie Morris, the author of Illicit, has kindly spared a little time to chat with me about the dilemma that Leia faces, and might even hint about how it will play out. But before we get ahead of ourselves, let’s wind our focus back to how it all started. Stephanie, what thoughts lead you to begin this novel? It began as a challenge and boy am I glad I accepted it. I had a reader who stated she’d like to see more older women/younger men trope books. This boxed set allowed me to take up that challenge and I had a blast. How challenging was it for you to work with this new relationship dynamic? Did you struggle with developing characters that matched the older women/younger men trope? Riley came to me instantly. He is the sort of character that you immediately fall in love with. Leia took me a while to figure out. She is very complex and has a lot of baggage. But as you find out her story, you will understand why. Was some of the baggage from Leia, or even Riley’s lives inspired from your own life? Yes and no. I like to date men with 3-5 years of my age range. However, it always ends up being older, not younger. So I decided to see what would happen if I allowed the creative part of my brain to drift in the opposite direction. Can you share a little of what that brain drift looks like when you write? What do you find is at the forefront of your mind? Honestly, I try to focus on the story and characters at hand. Otherwise it makes things very difficult. The characters run amok and it gets real interesting. However, I do certain things to set the ambiance for certain scenes. So if I’m writing a fight scene for paranormal I will listen to music that puts me into that mind frame. If I’m writing a small town romance, sometimes I take a drive to the family farm just to get myself in the frame of mind and so on. I really love that you take that extra time to get yourself in the right zone for the story of the day. Would it be fair to say that this process of getting your mind situated gets you excited for writing, or does the effort required to get your mind into gear get a bit too much? It honestly depends. There are times when I really feel the story that I’m writing, so like a good book, I don’t want to put it down. Then there are times when the story loses the flow for me and I’d rather do anything but write. I don’t mind those moments. It’s helps me to keep my life balanced. If I loved writing too much, I’d never get anything else done. Balance really is important, and I think that by giving your mind that space to breathe, you’re actually making your work better. Do you feel that this balance has helped your author voice improve as you’re kept writing? Yes. I cringe when I look back at some of the books that I wrote 10 years ago. I take writers courses and go on writers retreats to keep up with the changes in the literary world. I like to think that it is paying off. I’m sure that it is. And a quick way to check is to see what other projects you’re working on. What projects are currently on the cards for you? Too many too name. 2019 will be dedicated to finishing series that I started. There are eleven books on the schedule. So hold on, it going to be a wild ride. That’s awesome! With eleven books coming up I think it’s safe to say that your time in writers retreats is paying off! Clearly, you’re a woman on a mission, so I’m going to leave you to return to your writing so that we don’t have to wait long for the next one. Stephanie, thanks for sharing your writing journey with us, and I can’t wait to keep watching your progress in 2019! Excited to read the book we discussed today? Find it here on Amazon: ‘Illicit: A Contemporary Romance Collection ( ASIN: B07K8MT6GY )‘. 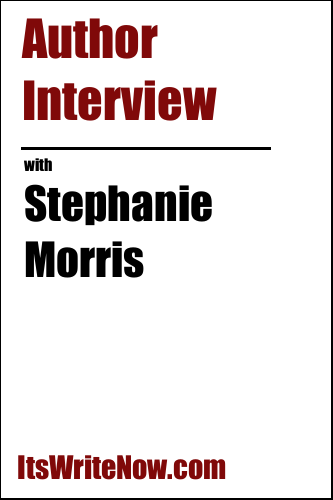 Want to find out more about Stephanie Morris? Connect here!